The presentation will discuss the importance of project management; a combined approach for a reliable end product; heavy-duty propulsion – design for permanent use in severe environments (fishing boats, ferries, service boats, etc. ); the importance of customizing to particular requirements for best results and energy cost savings; smart grid technology – adapted for sea or land, with real-life examples; the increasing importance of electric propulsion with today's environmental standards. Aluminum-air (A2) batteries have been discussed for decades, and recent developments in the technology have allowed them to be widely used. Phinergy Marine uses mature applications on the shore side to build energy storage systems for marine applications. Various advantages exist, such as high power density, availability of raw material, and sustainable and recyclable technology. At the same time, there are challenges such as waste heat recovery. For the first time, a containerized A2 battery system is presented here, with wide applications for vessels, ports and offshore units. The presentation will discuss permanent-magnet motors, batteries and electric propulsion. Examples of hybrid applications will be presented for a range of small craft. Vessels include workboats, ferries, passenger craft and even a floating cinema. Typical hybrid configurations will be presented together with a discussion on the pros/cons of using this technology. We will also explain why lead/acid technology is not dead yet and demonstrate cost-effective applications that are still in successful operation after 10 years. The presentation includes information on recent installations, results of fuel-saving performance as well as operator feedback. Development of the auxiliary wind propulsion market is also discussed. 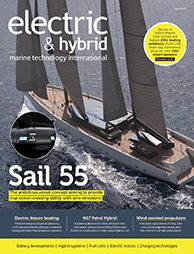 The electric revolution in marine is happening now. Danfoss's electrification expert will explain how powertrains are electrified in different powertrain systems, and will provide many excellent references to showcase success stories. The presentation gives an overview of two recent European maritime hydrogen and fuel cell projects: MARANDA and FLAGSHIPS. VTT is the coordinator of both projects. The ORC 136.HY is a parallel hybrid pilot boat, thanks to the Transfluid Hybrid System, which will combine both diesel and electric power and has been designed to be completely emission-free when operating in electric mode. The new pilot cutter, which is expected to reach up to 15kts under hybrid power, will be used by the PLA for the transfer of pilots to and from vessels in Gravesend Reach. Transfluid's Ugo Pavesi will provide a brief introduction, followed by a presentation by Alan Goodchild CEO of Goodchild Marine, which built this first hybrid pilot boat for the Port of London. Esco Power developed the Parallel Hybrid Transmission (PHT) to supply the growing demand for hybrid systems in the maritime industry. The PHT fits between the diesel engine and marine gear with standard SAE housings, and incorporates a built-in ratio that increases generator rpm to give higher efficiency, and decreases rpm when propelling electrically to give an increase in torque. The PHT can be completed with a hybrid-electric solution package that contains all electrical components. Together with a partner, Esco can offer batteries and be a one-stop shop for hybridizing ships. The growing demand for batteries is driven by the growing demand for BEVs (cars and ferries). Heat dissipation is critical to protect sensitive electric components and obtain a long lifespan of the battery pack. The challenge is to achieve a heat dissipation performance for power densities from 3.5kW/m² upwards and at the same time decrease the overall size and weight of the heat exchangers for maximum reach of the ferry. The presentation will explain how to rapidly real-time test using a Speedgoat-MathWorks real-time solution to apply controller prototyping or hardware-in-the-loop simulations. It will begin with an introduction about the quickest method to real-time testing using hardware from a desktop simulation stage. It will then explain how to use controller prototyping to decrease the amount of time spent on development or hardware-in-the-loop simulations to lower costs and reduce risks, using an example of a power electronics control and battery management system hardware-in-the-loop testing. We will present our latest development in stealth AC drives, now chosen by several nations for naval ship propulsion, and applicable for ships of any size and power due to the scalability in the Lean Propulsion technology from Stadt AS.